I’ve had the hardest time (for the past two days) coming up with a title for this article. Usually titles are instantaneous for me. I need to make sure the title is understood. I’ve been privileged, with a little help from synchronicity, to have been present at special women’s events, which have fired my cerebral process, moved me up on the learning curves of awareness, sensitivity and knowledge. Indeed, what an amazing 15 days; gifted to have absorbed, observed and learned. Cut to Tuesday March 27 at the Rutgers Business School for “A Presidential Symposium-Fighting Hate While Preserving Freedom: A Best Practices Forum.” The list of speakers beyond accomplished, from Jeh Johnson, Former U.S. Secretary of Homeland Security, Deborah Poritz, Former Chief Justice of the Supreme Court of New Jersey, Ronald K. Chen, Co-Dean Rutgers Law School, Mohammad Ali Chaudry, Co-Founder and President, Islamic Society of Basking Ridge, Rabbi Francine Roston, Kalispell, Montana, Imam Khalid Latif, Islamic Center at New York University, etc. I sat for eight hours, taking notes, listening intently, dreaming of a time in the world, when hate is gone. We need to realize that we together are all that there is to save our species. We’re all brothers and sisters on this insignificant speck of a planet in the middle of a complicated fragile universe and earth time is rapidly running out, passing the climatological and social tipping point. “Mother, what did I learn in school today!” My NOTES from the symposium: No one is born to hate. Love is natural. You can kill an enemy but not defeat an enemy. There is strength in diversity. New Jersey is the most diverse state; Rutgers the most diverse public university. Those who forget history are condemned to relive it. (I love that line from philosopher George Santayana). Best weapons against hate is students and young people. Interfaith partnerships can help prevent expressions of hate. Why an uptake in hate? Is it because a decrease in funding for mental health? The opposite of hate is not love, but indifference. 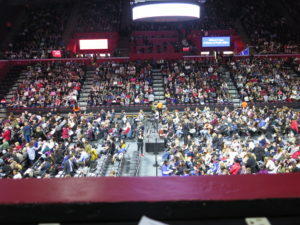 A few days later, on Thursday March 29th Hillary Clinton came to speak at Rutgers Athletic Center. 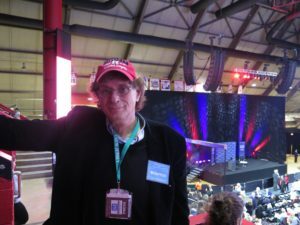 The demand for tickets forced the change in venue from the old barn gym to the RAC. I love journalism, being with NJ Discover and wearing my press pass, sitting in the press box with a perfect view of the almost sold-out crowd, including gym floor seating. What I did notice right away was the demographics; it would appear in an unscientific visual appraisal that 80% of the audience were young women. 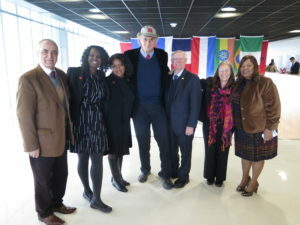 A few days later, on April 3rd, I attended ‘The Douglass Century Book Launch’ at Douglass College Student Center. “Douglass was founded in 1918 as the New Jersey College for Women with 54 students and 12 books in its library.” Indeed, it has grown to 2600 undergraduate students and over 39,000 alumni. 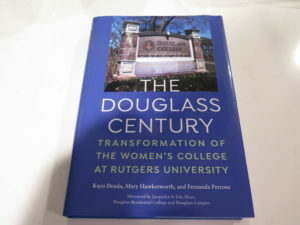 Three Rutgers faculty/professors collaborated on ‘The Douglass Century- Transformation of The Women’s College at Rutgers University,’ Kayo Denda, Mary Hawkesworth and Fernanda Perrone. 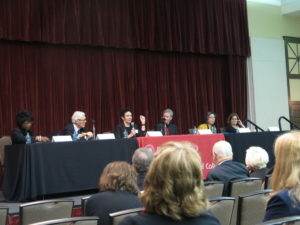 The event consisted of an Author’s Panel and Alumni and Faculty Panel discussions. What an absolutely wonderful book! Some themes of the night were how important women’s education, the history of Douglass and the New Jersey College for Women; how in 1915, there was a door to door campaign for $1.00 to raise $100, 000 to establish the school; how the school was not born diverse, with no Catholics, Jews, African-Americans under founder Mabel Douglass; how in 1968, 4% of the students were of color; how arguments surfaced, with Harvard philosophers, on the inappropriateness of educating women because of lower marriage rates of college educated women-all arguments against educating women; how CAWP at Eagleton is the first research institution for women in politics; how in 2017, 67% of Douglass women are of color, 8 % non-traditional age, 19% Latin, 23% Asian. What are challenges now? In 1930’s, there were 2000 Women’s Colleges; now there are 34. In a panel with Maurice(Mo) Lee Jr. who came to Douglass in 1966 and retired in 1996, he mentioned Professor Genovese at Rutgers New Brunswick, welcoming the impending victory of North Vietnam and Rutgers President Mason Gross not firing him. I immediately thought back to the symposium on Hate, and the students yelling and protesting and not being thrown out. The same First Amendment issues; a fascinating tie-in to last week. In 1965, I reminisced, that I had a date with a Douglass student. We were sitting downstairs in the lounge at Katzenbach dorm just past 10PM when a Rutgers police officer escorted me out. The curfew was 10 PM. I’d witnessed history and how far I’ve come. Watch how this next part of the story develops. Back on Friday, March 23rd. 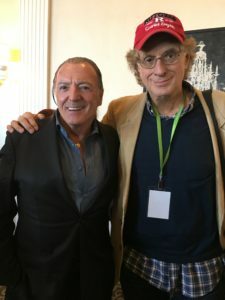 I attended the Garden State Film Festival Cocktail Party and Opening night Gala. Two hundred people in Convention Hall; many filmmakers, actors, actresses, media. I was covering the event for Artist Nation TV and NJ Discover. I always wear my Rutgers hat; my personal branding. A woman approached and asked if I was a Rutgers professor because of my hat. I responded immediately, “I wish and dream about that.” The woman was Dr. Gloria Bachmann, MD. Dr. Bachmann is the Interim Chair in the Department of Obstetrics, Gynecology and Reproductive Sciences, a Professor of Obstetrics and Gynecology and a Professor of Medicine at Rutgers Robert Wood Johnson Medical School (RWJMS), and the Obstetrics and Gynecology Service Chief at Robert Wood Johnson University Hospital, New Brunswick, New Jersey. 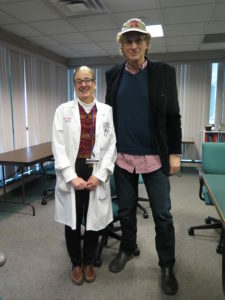 Also, at RWJMS she is the Director of the Women’s Health Institute and the Associate Dean for Women’s Health. 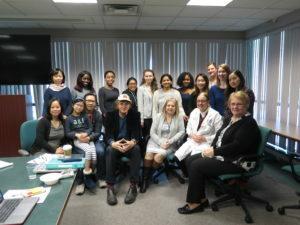 So, on Tuesday April 10th, I spent time at Dr. Bachmann’s Women’s Health Institute Meeting in New Brunswick with researchers and students. Again, in such short periods of interim time, my mind was expanded. I saw an animated film for children that they developed to explain, ever so gently, the topic of transgender. There were also discussions on female athletes (minimizing effects of injury), herbs and their mechanics, autism, One Health Initiative (Humans, Animals, Environment) cancer and aquariums. 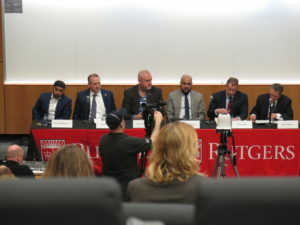 Of course, my passion in all of the above learning curves and observations is how much Rutgers is doing academically, clinically, sociologically and how NJ Discover’s platform can help tell their story, shout it out here in Central Jersey and beyond. On Monday April 16th I’ll be at a lecture on transgenders in the military. There are 1.4 million transgendered Americans. 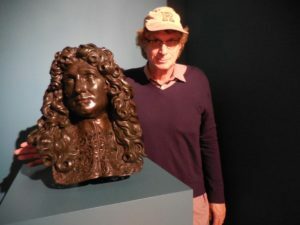 It is a brave new synchronistic interconnected world. Best way to end this article, is who would have ever thought all this goes down in a couple of weeks of mind expansion. The secret is to get off the sedentary sofa, explore and never stop. Wearing a hat helps too.